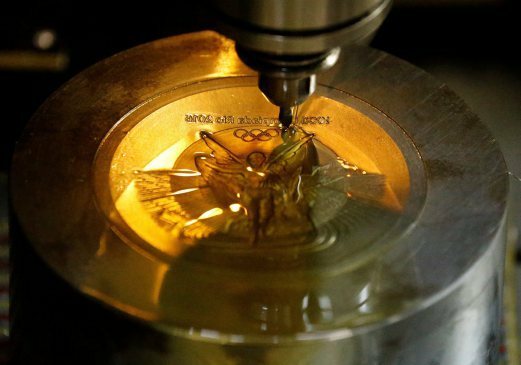 As only few more days left for the Rio 2016 Olympics, Brazilian Mint has started producing the Olympic medals that are official and that those will be presented for the winners in various Olympic and paralympic sports. As per the update from the Mint, it is known that they were producing a total number of 5,130 medals among which 2,488 medals were being produced for the Olympic Games and 2,642 medals for the paralympic games. All those medals will be having the images of the Rio 2016 Tom and Vinicius, mascots, the Olympic torch along with few of the landmarks of Rio de Janeiro. The medals that are awarded at the Summer Rio 2016 Olympics would be the most prestigious as well as sustainable medals that are presented ever at any of the Olympics. Medals which are going to be presented for the Paralympic sports will be giving the metallic sound when they are shaked and the idea behind this is to help the athletes who are visually impaired for identifying the variation between the medals. This will give a good experience for the visually impaired athletes. There are many such innovations that would happen in the Rio Olympics 2016. To know more such news, stay tuned to this site and check out the details of the Summer Olympics 2016 from time to time.